10 or 11 nights in ROYAL MAJESTIC HOTEL in Makkah (Saudi Four Star) or similar – 300 Meters from Haram, Easy walk in walk out hotel to and from Haram (Breakfast & Dinner included). 4 nights in New Gibson drywall real air-condition tents in Mena (Breakfast, Lunch & Dinner included). 1 night in Arafat real air-conditioned hanger- Arafat camp (Lunch included). 2 nights in ROYAL MAJESTIC HOTEL in Makkah (Saudi Four Star) or similar – 300 Meters from Haram (Breakfast & Dinner included). 3 or 4 nights in PROVINCE AL SHAM HOTEL in Madinah (Saudi Four Star) or similar – 200 Meters from Masjid-an-Nabawi, Easy walk in walk out hotel to and from Haram (Breakfast & Dinner included). Departure from Toronto (departures from Montreal, Calgary and/or Edmonton are also available with additional cost). Open buffet Breakfast & Dinner served daily in Makkah and Madinah Hotels. Canadian religious group leaders fluent in English, Arabic, Urdu and Bangali. Quad (4 persons sharing a room): $11,500.00 Per Person. Triple (3 persons sharing a room): $12,000.00 Per Person. Double (2 persons sharing a room): $13,900.00 Per Person – Limited Availability. Hajj Seminar for GTA Hujjaj before departure (live streaming for other cities). No Hajj building, no Azizia. 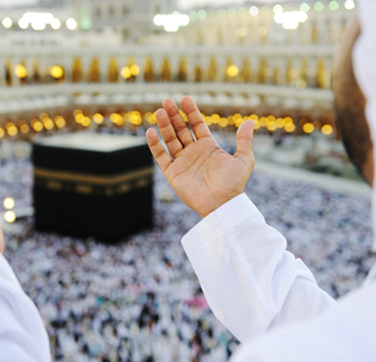 Keep Your Makkah Hotel during Mashaer (5 days of Hajj). Free hajj booklets and literatures included . Guided City Tour & Ziyarah in Makkah & Madinah. Detailed Tour &Ziyarah to Jannat-al-Baqi by highly qualified religious group leader (Cemetery in Madinah). Walking Tour and visit to Dates market in Madinah. Detailed tour to Masjid-al-Nabawi with our well experienced imams. Private air condition buses for long travel route from Madinah to Makkah or vice versa. New Freon Air Condition in Mina & Arafat.